Pomona, Calif. - Everett Charles Technologies' (ECT) announces that it will highlight the new HyperCore Base Material in Booth #20 at the upcoming Silicon Valley Test Workshop, scheduled to take place Wednesday, August 29, 2012 at the Biltmore Hotel in Santa Clara, CA. 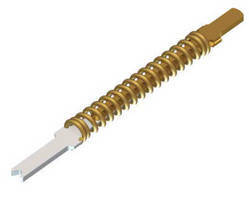 HyperCore is a proprietary base material developed for the highly scalable, fine-pitch ZIP® probe series. HyperCore Base Material requires no plating and features high hardness of 600 Knoop. It resists tip deformation and wear typically generated by cleaning cycles and high volume production. As it is non-plated, it can be repeatedly cleaned providing unprecedented probe life. Contact resistance and RF behavior is equal to gold plated BeCu. For example, the Z0-050 HyperCore yields stable 50 milliohm resistance and >40 GHz bandwidth. HyperCore also resists oxides similar to gold, yielding performance that will not waver even in the most stringent environments. ZIP® Z1 and Z2 - High performance production contacts that service standard and high-speed applications in .3mm, .4mm, .5mm and .8mm pitches. ZIP® SCRUB(TM) - The ZIP® SCRUB pin features a patented scrub-action. Designs for leaded, pad and BGA applications provide a self cleaning penetrating motion every compression which extends the mean time between cleaning cycles. ZIP® KELVIN - ECT's ZIP® KELVIN is ideal for voltage sensitive device tests on array or peripheral devices requiring sub-1 ohm resistance measurements typical in RDSON and high-power applications. ZIP® SUPER SHORT - The SUPER SHORT is designed for 0.5nH low impedance, high frequency testing. ZIP® Extended Length - The ZIP® Extended Length lines enable quick-turn customization of travel and OAL up to 6.7mm. The Z3 line was developed for applications where contacting large devices and strip packages requires a high degree of compliance. Z8 ¯The Z8 is designed for burn-in applications. It combines the performance features of standard ZIP® architecture with a burn-in price point. The Z8 has the same form factor as the Z1 and Z2 lines so migration from lab characterization to high volume production is seamless. The ZIP® patented 2-D design features planar contact surfaces fabricated by a unique manufacturing process, delivering maximum performance and cost advantages. The ZIP® Series is designed to meet today's demanding test requirements and economics. Everett Charles Technologies is a subsidiary of Dover Corporation (NYSE: DOV) a leading manufacturer of electrical test products and services, including Pogo® test contacts, semiconductor test products, bare-board automatic test systems, and bare and loaded PCB test fixtures. ECT manufacturing, service, and support facilities are ISO registered with locations throughout the United States, Europe, and Asia. The company has been awarded numerous patents and participates actively in developing industry standards. Corporate offices for Everett Charles Technologies are located at 700 E. Harrison Ave., Pomona, California, USA, 91767. Additional information about ECT is available via the Internet at www.ectinfo.com.